Flying around a corner, the lush coastal forest trees a blur in my peripheral vision, I locked onto the trail dipping below the horizon. I gripped the handle-bars; white-knuckles. I kicked the pedals into gear. I found my balance. I grinned wide, even with the threat of trapping bugs. And then I sailed away, down and down some more and around wide turns, the fir-needle trail sliding silently under my big-burly tires. After nearly 15 years, I finally got back on a mountain bike. Riding along the Wilson River Trail in the Tillamook Forest about half-way to the coast from Portland, I found another sport that makes me as happy as hiking (or at least it did this first time, I hope it keeps it up!). While I typically think while I’m trekking through the forest or desert floor, there was no time to think while mountain biking. No time to over analyze my worrisome mind, no time to scrutinize my self-image, no time to doubt my direction/career/writing/diet/money/hair color. I just biked, tried not to fall, and enjoyed the trill. That was all I was concerned with. Living in the moment with wind whipping my hair like a crazy Amazon women on a roller-coaster theme-park ride (but without the annoying, hyper colorful cartoon characters attacking you from all angles). And sometimes I need that. 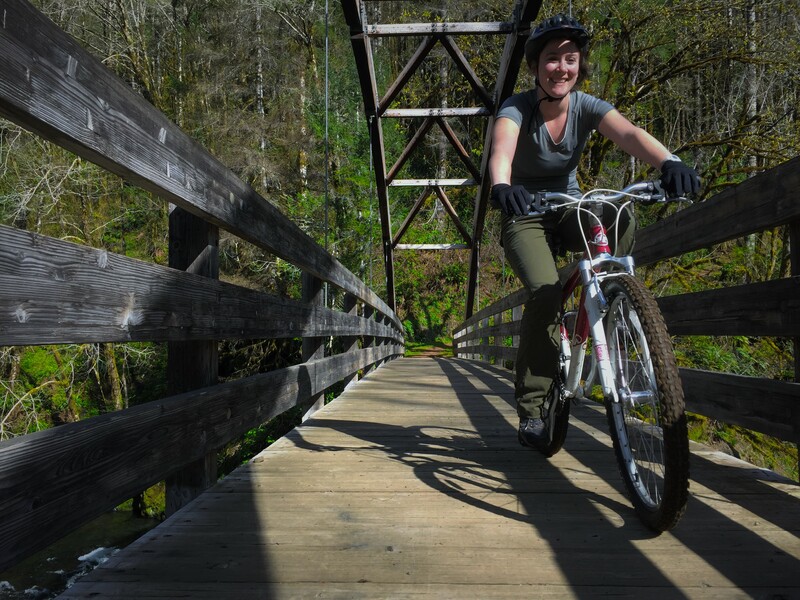 Paralleling Highway 6 and a rushing creek in the Tillamook Forest, the Wilson River Trail features 15-20 miles of single-track trail. You can start from several different entrances, but we started at the Elk Creek Campground, which is just 5 miles past the summit of the Coast Range. During the summer the gates are open to the campground and you can park near the trailhead, yet in the winter you’ll have to park by the road and ride in. The trail starts just across a bridge on Elk Creek with a steep uphill. We biked from Elk Creek Campground to the Smith Homestead, traveling east to west. However, we only passed other riders going the opposite direction and there was a huge uphill section about half-way through the trail that we had to push our bikes up for almost an hour, so I don’t know if there is a right way and whole way on this trail! But at the top of the trail, we enjoyed beautiful views of the mountains and refreshed ourselves in the cool breeze. The trail is rated a blue diamond due to its elevation change and some exposures, but otherwise there’s very little technical portions.